Media pluralism has suffered another major blow in Hungary. Magyar Nemzet, a newspaper that represented a brand of conservatism that was still able to critically evaluate the governing of Viktor Orbán, was shut down following the Prime Minister’s most recent election victory. Just two days after Viktor Orbán’s third consecutive two-thirds majority victory in the Hungarian parliamentary elections on 8 April it was announced that Magyar Nemzet, one of Hungary’s oldest and most prestigious daily newspapers, is going to be shut down immediately. The last issue was published on 11 of April; almost 80 years after the newspaper first began. The reasons for the closing of the renowned paper are manifold: The first is that it is owned by Lajos Simicska, a formerly close friend and ally of Viktor Orbán who managed to accumulate approximately 360 million euros by 2015 (according to the calculations of Forbes Hungary), mainly through good relations with the government and profiting from overpriced public procurements. For still-unclarified reasons, after Orbán’s second consecutive election victory, Simicska got into a fight with the Prime Minister and quickly became his arch-enemy, using his media empire as an instrument to weaken the Government’s position. The paper did not engage in slander or anti-government propaganda; it was enough for Simicska to give journalists a free hand and finally let them work without the pressure and censorship they had become used to during the years when Simicska was living off of his government ties and enriching himself on taxpayer money. The second reason for the closure is that the government has made journalistic work at Magyar Nemzet and other Simicska-owned media (for example InfoRádió, which was shut down together with Magyar Nemzet; and Hír TV, where serious layoffs are expected) increasingly hard. Whenever journalists for those media outlets sent inquiries to ministries or other public institutions, their questions were left unanswered, their interview requests were rejected, and they were often subjected to the slander of the newly-established state propaganda outlets (while this treatment was not uncommon when dealing with centre-left or independent media outlets, in the case of the Simicska-owned outlets the government has openly declared many times that it is not going to answer any inquiries from them). The third reason is financial: Magyar Nemzet used to make more than 3 million euros in profits each year — as long as its owner was in favour of the Government. Once the situation changed, the profits quickly turned into losses of 2-3 million euros per year. This is in part because many of its previous print readers turned their backs on the paper once it started to criticise Viktor Orbán and his regime (while the paper did manage to significantly increase its readership, online journalism is still unable to create the same revenues as print editions). In addition, the paper has lost all its state advertising revenues. This latter point is especially relevant since, in the Hungarian system, advertisements by the state or by state-owned companies, such as the gambling-service provider Szerencsejáték Zrt. or the Hungarian Electrical Works Company (MVM), are used as indirect state subsidies. As studies by the Mertek Media Monitor, an NGO focusing on issues related to the freedom of the press have shown, these subsidies disproportionately favour media that follow the Government’s narrative in their reporting. The few opposition news sites that receive state advertisements are seen as government-controlled opposition sites where critical voices can still appear, but where investigative articles have no raison d'être. In this sense, Hungary has lost the last political daily that was still willing to be critical of the Government. In recent weeks numerous stories about the corrupt activities of Government members had been broken by Magyar Nemzet. In Hungary, the state is the biggest advertiser these days, to say nothing of the fact that many commercial companies mimic the state’s advertising tactics and only advertise in pro-Government outlets out of fear that they would otherwise lose out on public procurements or would be subjected to new taxes and regulations. With the closure of Magyar Nemzet, Hungary loses a unique conservative voice which was (at least in the last three years) willing to combine its worldview with a critical stance towards a Government that may define itself as Conservative, but that can rather be described as reactionary and far-right in terms of its actions. Even as a pro Government news outlet in the pre-2015 years (the reporting of which was often extremely biased, but still refrained from fake news and outright propaganda), Magyar Nemzet managed to produce well-researched articles and quality content, although these were mainly on topics that were outside party politics. In 2012, for example, the most prestigious Hungarian journalism prize, the Soma investigative award, was given to Zoltán Dénes, a journalist with Magyar Nemzet. While Magyar Nemzet’s reporting was becoming increasingly critical, Fidesz started to create a new, pro-Government news environment, made up of numerous newly- established outlets now controlled by the Cabinet Office of the Prime Minister. According to investigative news reports, this office dictates what topics friendly newspapers should cover and sends them whole stories or guidelines regarding the use of language (the word “refugee” should, for example, be avoided and the term “migrant” should be emphasized). When looking at these outlets, we can often see that the same politically-motivated story is cross-published on a large number of pro-Government platforms in order to increase their reach. The aim of their coverage is to strengthen the Government’s position and discredit the opposition by spreading biased, opinionated, and often fake or fabricated news, and by openly taking a stance on issues of public interest. The site 888.hu, for example, advertised a pro-Government demonstration called the Freedom March (Békemenet) that took place on the Hungarian national holiday of March 15, and in the days prior to the election, the articles that were featured on pro-Government media either covered issues related to the Government’s major campaign topics (especially the dangers associated with immigration) or listed reasons why one should vote for Viktor Orbán’s party. One of these Government mouthpieces, Figyelő (a formerly renowned news outlet that was bought, restaffed and completely transformed by the conservative historian and director of the controversial House of Terror museum, Mária Schmidt) has now published a list of approximately 200 people allegedly working to further the goals of George Soros in the country. The article itself reads like a joke — it mentions that some of these “mercenaries” might not even know they are on this mission and lists the names of NGO employees, as found on their respective websites, while also including some rather unexpected people, such as Ernest Gellner, the renowned nationalism scholar, who passed away in 1995, or the historian Yehuda Elkana, who died in 2012. However, this could signal some serious measures are about to be unleashed, as the campaign against the Central European University was also preceded by a defamatory article in that same newspaper last year and was soon followed by the adoption of a law that aimed to outlaw the Hungarian-American institution. Furthermore, prior to the election, in his speech on 15 March, Viktor Orbán promised retaliation against those who have been in opposition to the Government, which for many people in the opposition means there is not much ground for optimism. During the weekend following Fidesz’s new election victory approximately 100 000 people gathered on the streets of Budapest and joined a march from the Opera House to the Parliament building. Their aim was to show that regardless of the governing party’s major victory (whose 49 percent support got them two-thirds of the seats in Parliament), there are still significant numbers of people in the country who have different preferences and disagree with the ways the Government handles issues such as immigration, education or public health, and who disapprove of the high level of corruption as well as the growing euroscepticism in the country. The demonstration was also a sign that a large part of the population expects the Fidesz Government’s constitutional majority will lead to a misuse of power and that Fidesz will further dismantle checks and balances and crack down on civil liberties. It has already been announced that the governing party will push through its so-called “Stop Soros” laws, a package of bills targeting civil society organisations that work with refugees and migrants. 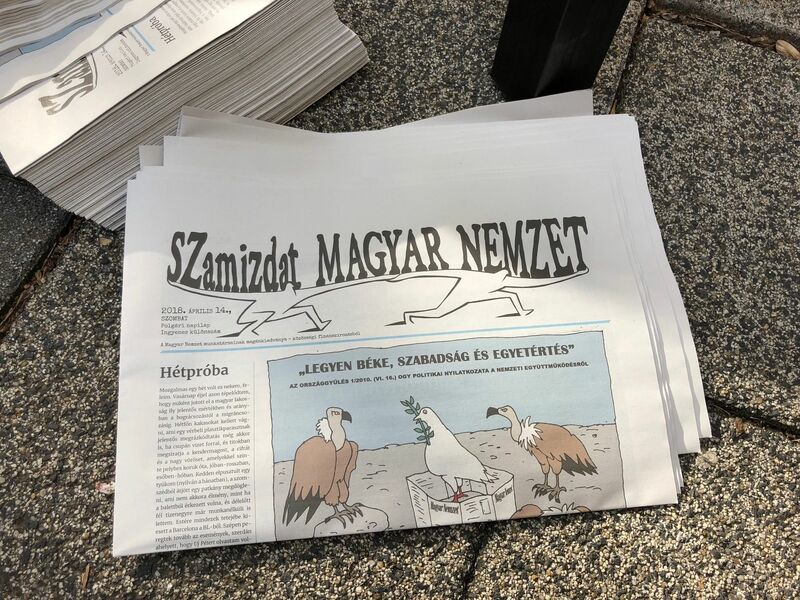 The journalists of Magyar Nemzet prepared a special, self-published “samizdat” version of the newspaper, which they distributed in 40 000 copies among the participants in the demonstration. The employees of the paper still hope that their publication could be saved; even if the print daily won’t resume production, they would see it as feasible to have a print weekly magazine and an online news site that continues the tradition of the paper. However, it is expected that Simicska would be reluctant to give away the Magyar Nemzet brand out of fear that a businessperson from Orbán’s circles could somehow acquire the name and use it to legitimise a new pro-Government outlet with the 80-year-old brand name. In the meantime, the ordeals of the Hungarian media landscape ordeals are not over. Not long after the announcement about the fate of Magyar Nemzet was made public, the news came out about the closing of another independent news outlet: Budapest Beacon, which has been a crucial site for those who were interested in reading objective English-language reports about Hungary. Who knows which outlet will be next to cease publishing or fall prey to capture from the Government? There have already been reports about the government’s intent to somehow acquire Index.hu, the second biggest news site in Hungary which, regardless of its critical stance toward the Government, is still widely read among Fidesz voters. The other outlet important for the government would be RTL Klub, the biggest commercial TV station in the country, which is currently owned by the German-based Bertelsmann corporation. In a recent interview in the magazine Magyar Narancs, Professor Jan-Werner Müller of Princeton argued that the Government’s control over crucial news sources, such as all regional media, can already be seen as a barrier to the fairness of the elections, as crucial information is unable to reach the voters. Once the above-mentioned outlets are captured, there will be complete Government dominance of the media in Hungary, as the target audiences of the governing party will be completely cut off from information that could become uncomfortable for those in power. Critical media will form a small island on the Internet and in the print media market, and such outlets are mainly read by intellectuals in the capital. There are, of course some efforts to change this bleak outlook. News outlets such as 444.hu and Mérce.hu are still growing their audiences, atlatszo.hu, Abcúg and Magyar Narancs invest great resources into covering the problems of the countryside, and Szabad Pécs, a small, regional newspaper run by journalists who lost their jobs due to the Government’s takeover of the regional press, has announced that it will start a crowdfunding campaign to set up a network of investigative journalists who will cover those parts of the country that have previously slipped beneath the radar. The number of independent media and persistent journalists shows us that the independent press is still not lost, but those working on informing the people have to put even more effort into their work while knowing that the next four years will be characterised by constant Government pressure. This article is part of our ongoing special "Focus on Hungary". The term refers to a form of dissident activity in the former Eastern Bloc: underground publications that wer banned or censored by the state were reproduced by individuals and were passed from reader to reader. Hungary has become a laboratory of illiberal governance tailor-made to serve Fidesz’s goals. Its rhetoric is based on identity politics, conspiracy theories and enemy images. It has a massive Government-financed fake news industry. After this ellection a shift to a more moderate stance is not expected. According to a recently surfaced voice recording, Hungary's House Speaker László Kövér admitted during a private discussion that Fidesz manipulatively redrew the borders of single-member constituencies for its own benefit.